The early part of this year I was contacted by dive buddy Wayne Harland to see if I would be interested in going to the Grenadines in the West Indies to island-hop and dive for shells. My answer - absolutely! It would be an extended trip of two weeks from September 27 through October 11, 2000 staying on Union Island with night-diving excursions to Mayreau, Tobago Cays, Palm, Carriacou, Petit St. Vincent and Petit Martinique Islands. Four divers would take part in this trip, Wayne Harland (Pompano Beach), Jim Jacaruso (Palm City), Rob Massino (Ft. Myers) and myself. The cost would be split between us, and Rob made the dive arrangements with Glenn Roy, owner of Dive Union Island. Jim forewarned us that there had been problems in the past with this dive operator, but we were very optimistic. And besides - it was an opportunity to see new exotic islands and to investigate underwater reefs at night. Who could resist? Once settled into the Sunny Grenadines Hotel, we found it adequate (well, almost) with a great view of the water from our 2nd story rooms (yes, lug all that heavy dive gear up and down steep steps), and it had air-conditioning (scarce in these regions.) Who knew we would have to arm-wrestle clean towels and toilet paper from the maid - when we could find her. Nothing could dampen our spirit and the first night we chose to dive on the wreck "Perune" in Mayreau Island harbor in about 40 feet of water. Once on the bottom we found the wreck with our powerful dive lights and saw lots of tropical fish, pastel colored soft corals and red sponge growing on the hull. 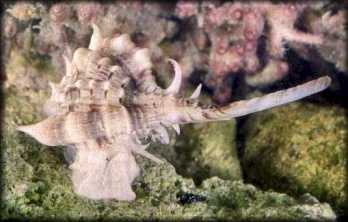 A very nice dark West Indian Murex [Chicoreus brevifrons (Lamarck, 1822)] and an orange Atlantic Trumpet-triton [Charonia tritonis variegata (Lamarck, 1816)] were found by Jim. The rest of us brought up small shells but nothing special. The second dive that night was the south edge of Mayreau harbor. The bottom looked good - coral rubble with sand patches. Wayne found a beautiful Music Volute [Voluta musica Linnaeus, 1758], and I picked up Chestnut Latirus [Leucozonia nassa (Gmelin, 1791)], Lightning Olives [Oliva fulgurator (Röding, 1791)], Carrot Cones [Conus daucus Hwass in Bruguière, 1792], and an Angulate Wentletrap [Epitonium angulatum (Say, 1831)]. sand humps. White sand as far as you could see with large 1-2 foot high humps/hills of sand made by a marine worm…and nothing else! No coral, no rubble, no grass, no fish; this definitely would not be the most exciting dive we have ever made. No one saw anything resembling a shell. Where were the dead bivalves, the trails in the sand? Nothing! Back in the boat we decided we were too shallow - we would try deeper water. The next dive we jumped into 40 feet of water, and upon reaching the bottom, I found the two prettiest Dominican Cones [Conus dominicanus Hwass in Bruguière, 1792] I have ever seen. What a thrill to see them gliding along the sand. Mucus from the animal was holding sand on their dorsal surface, which helped them blend into the sand bottom. Sixty minutes later, just before I surfaced, I found another. Back in the boat I discovered that Wayne had found one, but it was damaged and he left it on the bottom. Jim and Rob had yet to see one. The following day we decided to scout Chatham Bay at Union Island for spots to dive that night. We found an area in 35 feet of water where the dense coral reef rolls down to the sand/grass bottom in 70 feet of water, and we marked this spot on the Global Positioning System (GPS). Our second spot was inshore in sand and grass in about 18-20 feet of water. That night we left at about 8:00 PM to head for Chatham. The wind and seas had picked up considerably, and it was a rough 40-minute ride to our destination. Using the GPS we found our position and anchored in 40 feet of water, jumped in and worked down the reef to a depth of 80 feet. Wayne found one Dominican Cone that was much smaller than the Tobago Cays specimens but more brightly colored. 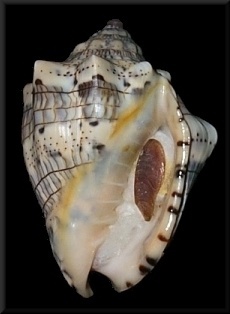 Jim found three nice Messorium Murex [Haustellum messorium (G. B. Sowerby II, 1841)] on the sand. Our next dive produced more cones, and I even found one. We all looked through the lush dense coral reef for shells, but the coral community species were just not there. Very strange! In the Bahamas a reef such as this would have Turbos, Cones, Vexilliums, Pectens, Cypraea and other species. The following day a tropical depression blew in so we spent that evening at our favorite French restaurant the "Bougainvillea" where we dined on Callaloo soup, Curry Chicken, refreshing drinks and told tall tales while relaxing and enjoying each others company. With daybreak came much better weather, and, while at breakfast at the Clifford House (a restaurant that really served breakfast), we decided to rent a taxi and tour the island. It is a beautiful island of about four miles across by three miles long. The hills and yards are covered with a dense dark green grass mat - its like the whole island has a beautiful thick green carpet. The homes have lots of tropical foliage, and every yard comes with at least one goat. Even undeveloped land had coral vine in bloom - a charming and beautiful place. For the next few nights we visited Chatham again with about the same results and decided to go back to Tobago Cays. We thought we would do better there if we could cover more ground. So Rob and Jim bought 80 feet of poly-line and attached an underwater strobe to it so we could go with the current, and the bright strobe flashing on the bottom would help us stay together. This worked great; we let the current do most of the work, and we were able to cover about two miles of bottom on each drift. We all found more Dominican Cones but nothing else. after a few phone calls, Wayne, Jim and I decided to hop on the ferryboat and make the three-hour trip to Bequia Island for the remaining six days of our trip. Regretfully, Rob had to head home as business beckoned. Bequia has always been one of my favorite places. It is one of the more undeveloped charming, islands, and its seven square miles remain among the most picturesque of the Caribbean. It was once a busy center for whaling, and Bequia still retains its traditions and maritime skills with a community of seafaring fishermen and boat-builders. We stayed at the lovely Gingerbread Hotel located at the waters edge. The first night we went to Lower Bay where we had found Matchless Cones [Conus cedonulli Linnaeus, 1767] before. Now they were few and far between. After two dives, Jim had found 3, Wayne -0, Charlotte -0, but I did find some nice live Spiny Caribbean Vases [Vasum capitellum (Linnaeus, 1758)], and fresh dead Speckled Tellins [Tellina listeri Röding, 1798], King Venus [Chione paphia (Linnaeus, 1767)], Eggcockles [Laevicardium serratum (Linnaeus, 1758)], Atlantic Strawberry Cockle [Americardia media (Linnaeus, 1758)] and Reticulate Cowrie-helmets [Cypraeacassis testiculus (Linnaeus, 1758)]. Our boat operator was a young Rastafarian by the name of Antonio, who always seemed to be in "another world" but who was very adept at boat handling. Our next dive choice was Pigeon Island about five miles away. It is a rocky abutment with sheer sides that stick up above the water to about 75 feet in height and plunges down to a 100+ foot depth. We anchored up and proceeded to get ready to dive and a cloud of mosquitoes descended upon us. I had dozens of mosquitoes trying to land on my face at one time, so I was ready and in the water in record time. It was a beautiful dive; the face of the rock was ablaze with every color imaginable. Red sponge covers most surfaces, lavender, orange and yellow sponges were abundant, as were soft corals, sea fans and whips with the polyps open feeding on plankton, red shrimp, lobsters, and eels out searching for food. With very little current, you could just hover along the rocky walls looking for the elusive Glory-of-the-Atlantic Cones [Conus granulatus Linnaeus, 1758] while taking in all of the wonderful sights of this underwater paradise. I ventured down to the bottom at 110 feet to see if it was perhaps littered with shells. Then it was all to soon time to ascend and climb back into the boat and face the mosquitoes. Back to Lower Bay for the second dive to again search for Matchless Cones. On this dive I examined marine life and saw hermit crabs wearing long plume anemones, spotted trunkfish and the flying gurnard fish with its electric blue spotted pectoral fins. It was a delightful, relaxing two weeks. Friends asked me, "How was your trip, what did you find?" My answer, the trip was super! Great friends, wonderful sights, easy diving, with time to read three books, and, although I didn't find a lot, it was one of my favorite trips.